Orchid – Urban Elegance. A new form of beauty awaits at No. 3 Road and Lansdowne Richmond. Orchid by Beedie is launching in 2016. Elegance in design, beauty in form, Orchid by Beedie Living makes for an unforgettable first impression. Located in the heart of Central Richmond real estate district and steps from the SkyTrain Station, the new Richmond Orchid Condos offer a boutique living experience, with exclusive amenities, in an unparalleled location. Elegance in Design. Beauty in Form. 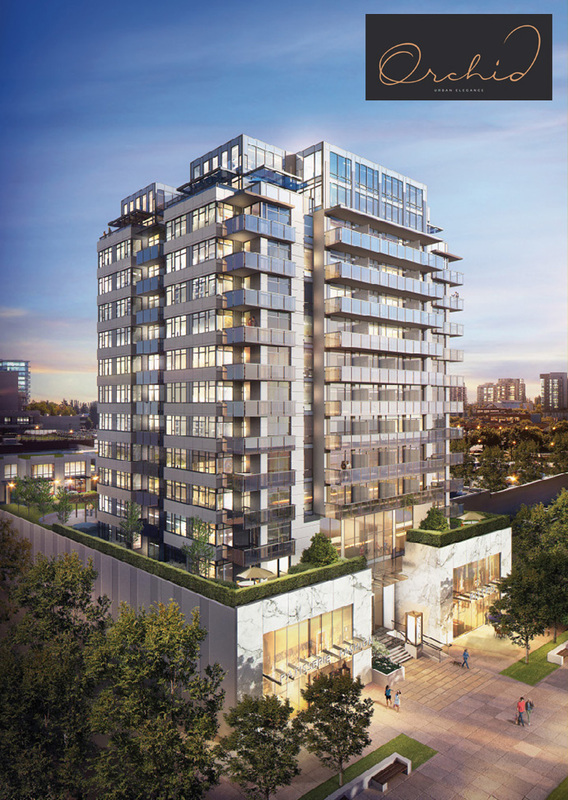 Orchid Richmond condos by Beedie Living presents exclusive amenities and unparalleled access to all the necessities of life and offers 122 sophisticated 1, 2 and 3 bedroom homes with larger penthouses and garden villas in an exceptional location. The contemporary building is designed by Rafii Architects Inc and DYS Architecture. In addition, the project will feature over 3,000 square feet of private amenity spaces and 9,400 square feet of outdoor spaces. The entrance lobby will feature frameless class curtain walls, luminous Carrara marble, warm neutral wood details and soft lines of orchids that welcome you home. As well, the new Richmond Orchid presale condos will feature an elevated garden terrace for the exclusive use of residents. Soft Japanese maple trees, exterior landscaping, an elegant water feature and playful children’s area will offer serenity within this bustling city. Located at No. 3 Road and Lansdowne Richmond Orchid condos will rise elegantly over a luxury retail podium. The 15 storey concrete high-rise tower is tailored to discerning buyers looking for boutique urban condos and the oasis amidst the dynamic city centre will put residents within walking distance to convenient luxury retail amenities and services. The Orchid garden villa homes are exclusive residences that overlook a peaceful garden retreat. The Orchid Condo Sales Centre is opening Saturday, March 19th at 5580 No. 3 Road Richmond (at Lansdowne Road). For more information, please visit www.orchidbybeedie.ca or register on this page for upcoming presales launch information. There are 2 colour schemes that include Pearl and Nero and they are carefully selected by Cristina Oberti Design. All homes have individually controlled air conditioning and heating system and all living spaces and bedrooms have rich laminate floors. The interior doors are modern and 7 feet and the suite entry door is solid core wood stained with quartz threshold. Every home has 8’8” over height ceilings and expansive windows with roller shades in addition to oversized balconies with water, city or mountain views. 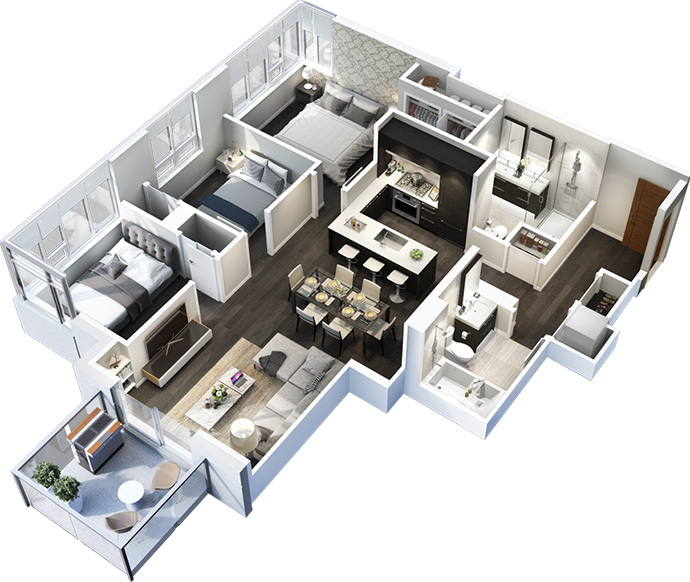 The presale Richmond Orchid condos come with LG Energy efficient full sized front loading washer and dryer with LED Display in addition to a USB port on electrical outlet in the kitchen and master bedroom. You will also receive one year complementary Telus Optik Internet and TV with PVR. 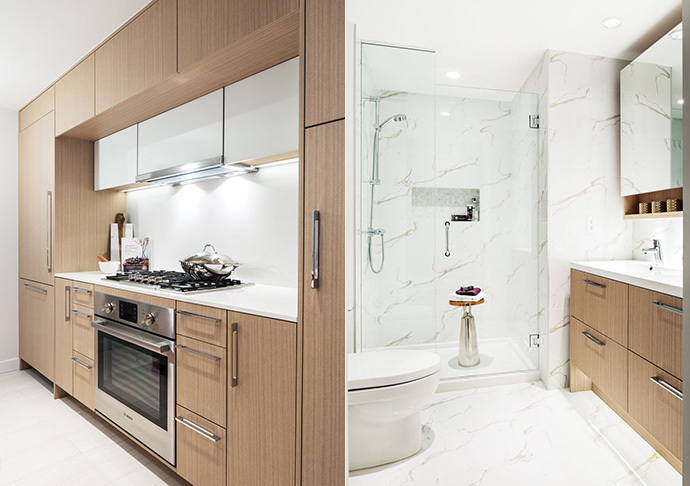 The designer kitchens at the preconstruction Richmond Orchid project will feature wood grain and pure white glass upper cabinetry and wood grain lower cabinets in addition to soft close cabinetry hardware with elongated polished chrome pulls and LED under cabinet lighting. The kitchens also have elegant quartz counters and backsplash in addition to a polished Grohe kitchen faucet, single under mounted sink and built in recycling station. The homes come with a premium Bosch integrated stainless steel appliance package in addition to a Panasonic inverter microwave. The beautiful bathrooms include a soaker tub for the main bathrooms and a porcelain tiled shower with marbled mosaic tiled niche in the ensuites. The showers feature over height frameless 10mm glass door. There are contemporary vanity cabinetry with custom mirro and medicine cabinet with under cabinetry lighting as well as polished chrome Grohe faucets with Acritec Pure Collection counters with integrated sink. The bathrooms at the presale Richmond Orchid condos by Beedie Living will also feature soft close dual flush toilet with skirted design. Enjoy over 3,000 square feet of indoor and 9,400 square feet of outdoor amenities. There is a furnished entertainment kitchen, dining room and outdoor patio for large parties and private functions, an air conditioned wellness centre with cardio area, weights, yoga studio and multipurpose dance studio with table tennis as well as a sports and entertainment lounge complete with games and card table. The Lansdowne Orchid Richmond condos will also feature a lushly landscaped garden with water feature, barbeque terrace, children’s play area and rotunda. There is also a fully furnished guest suite with kitchenette and bathroom. The building entry system with video enterphone and high resolution security cameras adds to your home security. Also, there is separate commercial and residential overhead gate for parking garage. The Orchid Richmond condo building also has encoded keyless access system with restricted floor access in addition to homes that are pre-wired for in suite security systems. The Orchid Lansdowne condos will be built to LEED Silver equivalency and will feature a 2-5-10 New Home Warranty by Travelers Guarantee of Canada. Orchid Richmond condos are conveniently located in the heart of Richmond, just steps from Lansdowne SkyTrain Station, where the Canada Line provides instant access to YVR Airport, downtown Vancouver or the newly opened McArthurGlen Designer Outlets. A short drive easily takes you to UBC, Burnaby or even the United States. Whether you’re heading to work or play, you’re just minutes away. 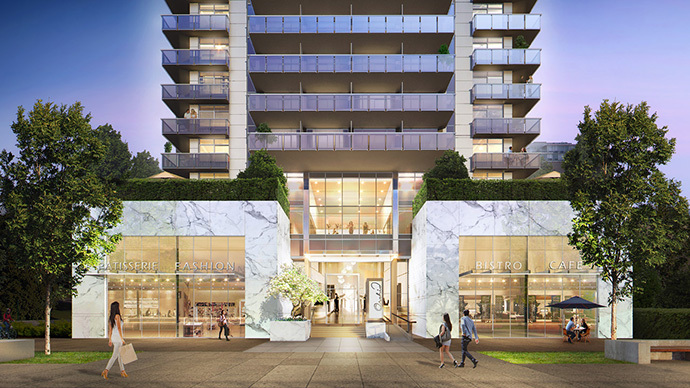 The presales Richmond Orchid condo project features one, two and three-bedroom homes in a tower that rises elegantly over a luxury retail podium framed with a Carrara marble facade and grand entrance lobby. A private entryway provides discrete access to parking for residents—your starting point for a host of adventures in this vibrant urban centre.